In 2007, President George W. Bush signed a bill that cut in half interest rates on subsidized student loans until 2012. Those low rates will expire on July 1 — going back to 6.8 percent from 3.4 percent — and, to prevent college from becoming even more unaffordable for millions of students, the obvious move is to renew them. But nothing is that easy or sensible anymore in Washington, where House Republicans are far more interested in cutting taxes, largely for the rich, than they are in helping low- and middle-income students get a college education. Instead, Republicans would rather pile that burden on the backs of taxpayers-to-be, specifically the 7.4 million students who now have federally subsidized Stafford loans and the millions more who will need them. At a time when many graduates are desperate for jobs, the interest rate increase would add an average of $1,000 a year to their debt. Already, many Republican lawmakers around the country have made it clear that they don’t even want students to vote, imposing identification requirements that would keep students away from polling places. Nothing is more important to this country’s future than ensuring a good education for coming generations. The issue also plays directly into Mr. Obama’s own need to re-energize younger voters, who turned out in overwhelming numbers for him in 2008 but seem far less enthusiastic these days. Once the White House began its effort, Mitt Romney broke with House Republicans and said Monday that he supports renewing the loan subsidies. As usual, though, that also meant breaking with himself, since he had fully embraced the House budget and never expressed any reservations about the student loan provisions. Indeed, only a few months ago, he argued repeatedly in interviews that student subsidies were a bad idea that encouraged colleges to raise their tuition. Mr. Romney, along with the Senate Republican leader, Mitch McConnell, said that the $6 billion cost of the subsidy should be offset with cuts to other programs, but predictably neither man said where those cuts should come from. The White House and Democrats have proposed raising the money by ending a loophole used by high-paid employees of S-corporations to avoid paying full payroll taxes. The Republican response to that idea is also predictable. This is a party that shows time and again that it wants to protect only those who have made it, not help those struggling to get started. Wisconsin is the only state in the nation to lose jobs over the last year. rejecting over a billion in federal investments. cutting shared revenue and investments in education. killing job creating wind farm investments through developer friendly regulations. 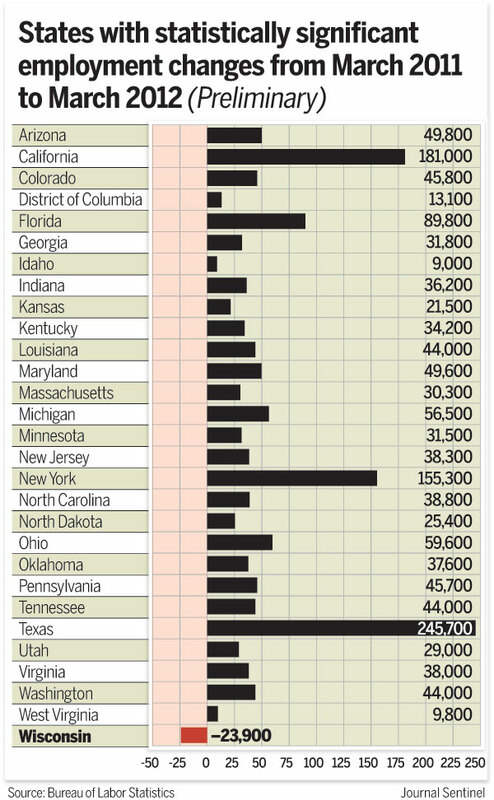 So much for Walker's empty promise of 250,000 private sector jobs. Wisconsin is the only state that had "statistically significant" job losses over the most recent 12-month period, according to the U.S. Bureau of Labor Statistics. 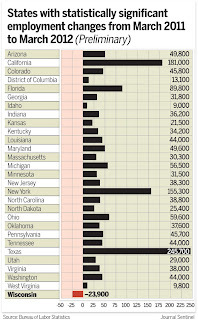 From March 2011 to March 2012, Wisconsin lost 23,900 jobs. That was the largest decrease in percentage terms in the country. Those job losses came from both the public and private sector, but the public sector job losses (17,800) were larger than the private-sector job losses (6,100). Wisconsin Governor Scott Walker promised to create 250,000 private sector jobs when he campaigned for office. Once elected, he slashed corporate and investor taxes. The result-Wisconsin has lost jobs in seven of the last nine months, 4,300 in March, and is facing a deficit next year. Earlier this week Wisconsin Governor Scott Walker traveled over the Illinois line to argue that the tax increase backed by his Democratic counterpart Pat Quinn is killing jobs even as the Midwest rebounds from recession. A broader snapshot tells a much different tale. Illinois ranked third while Wisconsin placed 42nd in the most recent Bloomberg Economic Evaluation of States index, which includes personal income, tax revenue and employment. Illinois gained 32,000 jobs in the 12 months ending in February, the U.S. Bureau of Labor Statistics found. Wisconsin, where Walker promised to create 250,000 jobs with the help of corporate and investor tax breaks, lost 16,900. Quinn was ready for the cross-border critique from Wisconsin, which led the nation in job loss in 2011. Quinn scheduled a news conference less than hour after Walker spoke to announce that LaFarge SA (LG), the Paris-based building materials maker, would move its North American headquarters to Illinois. Two days after Walker's trip to the land of Lincoln. the Wisconsin Department of Workforce Development announced that Wisconsin had lost another 4,300 private sector jobs in March. WASHINGTON -- Two Senate Democrats have found a new way to try to hit for-profit colleges where it hurts, by proposing a ban on the use of revenue from federal financial aid for advertising, marketing and recruitment. The proposed legislation is unlikely to go anywhere this year, and will draw little support from Republicans. But the approach is novel, and could be part of the longer-term debate on Capitol Hill about the regulation of for-profit institutions. The bill is also notable because it is the first legislative salvo against for-profits from Sen. Tom Harkin, the Iowa Democrat who has led a lengthy pursuit of the industry. And the legislation applies to both nonprofits and for-profits, a development applauded by for-profits, which otherwise criticized the bill. Sen. Kay Hagan of North Carolina joined Harkin in sponsoring the legislation, which would apply to all colleges that receive federal aid under Title IV of the Higher Education Act. However, the senators clearly took aim at for-profits, which generally spend much more on marketing to prospective students. Nonprofit colleges, particularly two-year institutions, often complain that for-profits use advertising to lure students who would otherwise attend community colleges. “We need to make sure that federal education dollars are spent on just that: education,” Harkin said. Among a group of 15 of the largest publicly traded for-profits, the average company in 2009 spent 23 percent of its budget on advertising, marketing and recruitment, according to research from the Senate Health, Education, Labor and Pensions Committee. By comparison, nonprofit institutions on average spend less than 1 percent of their budgets on marketing, according to the committee. The legislation would include in its ban on marketing expenditures the use of revenue from the Post-9/11 G.I. Bill and tuition benefits for service members. Currently, those military aid programs do not count as federal dollars under the 90/10 rule, which prohibits for-profits from drawing more than 90 percent of their revenue from federal aid such as Pell Grants and federal student loans. Protecting veterans and members of the military from aggressive student recruiting is a popular cause that some Republican lawmakers support. But this bill did not include a Republican co-sponsor. The legislation would not lead to changes in spending by most nonprofit institutions, observers said, because few are both heavily dependent on revenue from federal financial aid while also toting proportionally large marketing budgets. Even so, putting the legislation into action would be “extraordinarily difficult," Hartle said, because there is no easy way to determine what, exactly, constitutes marketing at nonprofit colleges. And while details were vague for how colleges would comply with the rules, Hartle said that added administrative burdens could also be problematic. “Implementation is never as easy or simple as the legislative branch would assume,” he said. Sen. Hagan said “there would be a certification process that would have to be signed” for colleges to continue accepting federal financial aid from their students. Senator Harkin, however, focused his comments squarely on for-profits, which he said have “dismal graduation rates” and spend “staggering” amounts of money on advertising and recruiting. However, he stressed that the legislation would not prohibit college ad buys. Yesterday was the birthday of Florence Reece, the coal miner's daughter active in Harlan County Coal strikes who wrote "Which side are you on?" Labels: coal miners, Florence Reece, Harlan County, Which Side Are You On? 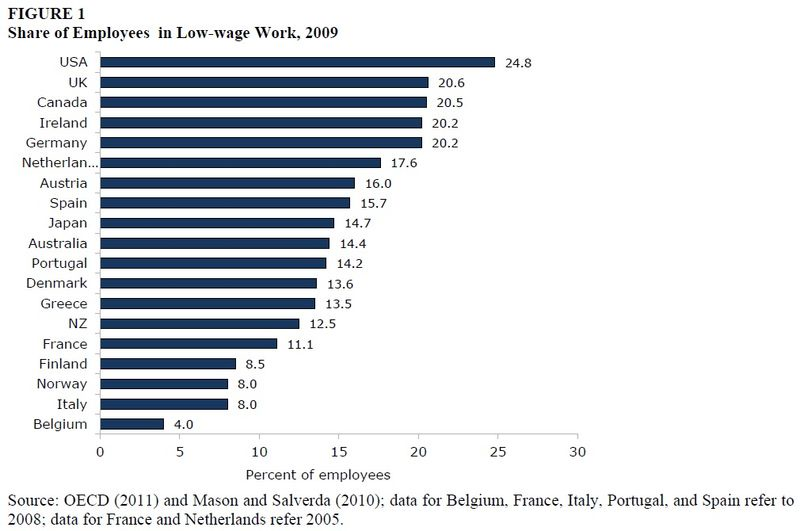 We're #1 ..........in low wage jobs! The United States used to pride itself on having the world's largest middle class. Following World War II inequality declined and the blue collar middle class grew. Economists call this period the Great Compression. It was a product of the New Deal, labor and financial regulations, widespread unionization, and social investments in education, science, research and development and the infrastructure. More than forty years of attacks on unions, deregulation, financial liberalization and privatization have undermined the middle class and the nation's shared prosperity. Inequality has soared to heights not seen since the Gilded Age. Upward mobility, once a hallmark of the America promise, is less likely than in other industrial democracies. The United States increasingly resembles a banana republic. The nation's business class has waged a one sided class war against the unions, wages and benefits of private sector workers since the 1970's. Now they and their political spokeman like Scott Walker have turned their fire on firefighters, teachers and other public servants. Business Week put it bluntly in 1974 when it declared: "Some people will obviously have to do with less...it will be a bitter pill for many to swallow the idea of doing with less so that big business can have more." 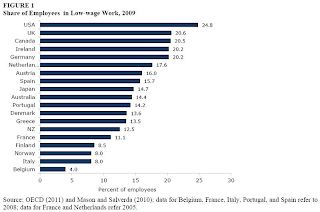 But are we are still number one ................in low wage jobs. Is this the America we want to leave our children and grandchildren? Governor Walker has what Steven Colbert would call a truthiness problem. Walker has traveled the country collecting huge campaign contributions from out of state millionaires and billionaires, people like the ultra right wing Koch brothers or Maurice "Hank" Greenberg, the discredited founder of the bailed out financial services corporation, the American International Group, whose financial loses contributed to the financial crisis that caused the Great Recession. Rather than admitting that he is a tool of out of state bosses, and I mean real bosses, Walker continues to try to discredit his opponents by claiming they are supported by "out of state union bosses." Union leaders, of course, aren't bosses at all. They are democratically elected leaders of democratic organizations of working people. But that aside. If you compare the source of Walker's campaign contributions to Kathleen Falk's you can see who is a tool of out of state special interests and who is being supported by the people of Wisconsin.